Cheese matters! Please, pass the cheese! That’s right folks. Eating cheese can provide many great health benefits. Not only does cheese taste delicious, most palates find it agreeable; it can also be good for you. Cheese contains several essential nutrients that people require in their diet. It contains protein, calcium, zinc, phosphorus, magnesium and vitamins such as A, B2 and B12. It should be included in any well balanced diet as it contains essentials that promote growth, development and it aids in repairing our bodies. It plays an important role in making sure we have healthy bones and teeth. Visit the Ashe County Cheese Factory for some fun Recreational Agritourism in Western North Carolina. School groups, families and other groups of visitors love to visit our Cheese Shop often. Stopping by the Ashe County Cheese Factory in downtown West Jefferson is one of the Fun Things to Do in North Carolina that is a bit different from the attractions that folks frequently consider. This historic factory has been creating delicious, creamy cheese of various varieties for more than 75 years! That’s a LONG time! 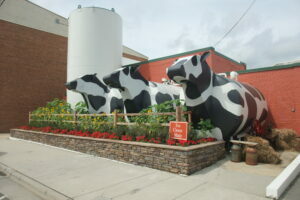 Patrons can tour the factory and see how cheese is made by witnessing it first hand for themselves. You can even view the cheese-making process from our viewing room. Search for inexpensive, fun, Things to Do in Western North Carolina or Things to Do in North Carolina Mountains? Our cheese store is located in the heart of downtown West Jefferson, a rural little mountain city with tons of history. Our factory is fantastic and the little town in which we are located makes it worthwhile to stop in for a visit. You can browse the nearby shops for great knick knacks and souvenirs. Click and view our events schedule to find out more about special Recreational Agritourism events and other things that we have planned. We are always making cheese, view our cheese making schedule. Interested in buying our Cheese Online? Click and Order Cheese Online directly from our Cheese Shops.